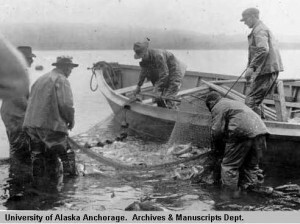 Seining for herring in Kodiak Harbor, 1919. Photo by Jasper Dean Sayre. UAA-hmc-0186-volume6-7495, National Geographic Society, Katmai Expedition Photographs, Archives and Special Collections, Consortium Library, University of Alaska Anchorage. Alaska is a particularly rewarding place to do research because we have first-rate archives, libraries, museums, and historical societies to help people learn about the past. If you are just beginning your research, the following lists should help you along. For example, if you are looking for books about Alaska and its surroundings, you might try one of the “Major Alaskana Collections” listed. If you are looking for information about your community or family members linked to a town or city in Alaska, a good place to start would be the list of “Historical Societies in Alaska and Yukon.” If you want historical photographs, maps, and other documents, you should visit some of Alaska’s large archival repositories or look at digitized materials on-line. On-line tools and specialized collections exist that can speed up your research. For example, if you are looking for historical film, the Elmer E. Rasmuson Library at the University of Alaska Fairbanks has a wonderful “Alaska Film Archive,” where movies from around the state have been preserved and duplicated. For Alaska’s historical newspapers you should take a look at the impressive microfilm collections of Alaskan newspapers housed at the Alaska State Library, Anchorage Public Library, University of Alaska Anchorage, and University of Alaska Fairbanks. And, it is even possible to do important research from home using on-line sources like Alaska’s Digital Archives, the Alaska State Library’s Historical Collections, or the Library of Congress’s Digital Collections. Wherever you start, you are guaranteed to find something interesting and rewarding. Please note: The information under “For Researchers” on the AHS website is intended as a springboard to research. The lists do not contain every history-related archive, library, museum, or community organization. If you do not find what you need here, ask at your local library or museum or contact AHS for more advice on how to start your research.